We had the recent opportunity to facilitate a review for Lysa Terkeurst's newest book. Win Or Lose I Love You. This whimsical fun little book teaches children about unconditional love, and that it's not always about winning but how well you tried. Teaching children how to handle winning and losing is important. So many times you see people lose or put aside who they truly are to push themselves to the top. It's important for children to know that giving it their best is what's really important. It's sometimes hard for us to accept that we can not win every time, you win some and you lose some. Win Or Lose I Love You! Is fun little book is geared towards children ages 4-8. It's a great tool in helping children understand that as long as you are true to yourself, God and others while you give it your best shot that is what matters, because you are loved unconditionally by your parents and God. 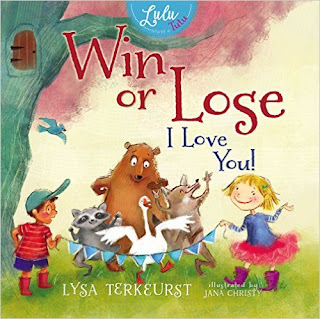 Join Lulu and Max as they help Bear Bear, Goosey, Coyote, and the rest of their animal friends in the Field Day contests determine who will be the leader of Lulu's forest. But, the animals soon find out, not everyone can win. Sore losers, unkind winners, flaring tempers and a few tears will take all the fun out of Field Day! Lysa Terkeurst is the New York bestselling author of the book The Best Yes. She is president of Proverbs 31 Ministries and writes from her sticky farm table in North Carolina, where she lives with her husband Art, her five children, three dogs, and a mouse that refuses to leave her kitchen. This is a fun book for children to learn about good sportsmanship and keeping a positive mind set. I like that while we continue to read this book again and again, our children are learning valuable lessons. I think that's what makes a book great, is when the moral of the story is to teach something useful and this book has many good values to teach young children. In the back of this book there is a list of 10 Biblical words of wisdom about whether you win or lose. Wow! This book has some really good life lessons! Mainly always just do your best on any and all situations and don't try to be something that you aren't! Thanks for the Review! I really need to get this book for my nephews. They are both brothers, 3 and 5, and are so incredibly competitive. When one of them loses, they throw a tantrum and by the end of it, they both end up crying and upset. I think reading this to them and teaching them that both winning and losing is okay and a natural part of life, maybe they will deal with it a little better. Thanks for sharing! This sounds like such a wonderful book!! I am definitely getting this for my children!! Love that the author has a "pet" mouse in her kitchen!! I teach preschool and I am always looking for good books with a message to read to my kiddos. Thanks for the post. I absolutely agree!! We need to teach our kiddos that winning and losing happens but family will always be there no matter what!! I am furious that schools now are teaching kids that everyone wins... while that's great to be fair but life isn't that way!! We have taught my son that sometimes we lose and sometimes we win but the important part is that you always keep trying!! Sounds like a great book! I think parents should keep reaffirming to their children their love is constant, no matter waht. This sounds like a cute book. It covers an important topic for children. What a great book! This would be great for my school agers! What a cute book. When I was a nanny one of the boys had a REALLY hard time losing, and I felt like I could never find a way for him to understand that just because you lose, does not mean your a "loser" I have not had any problems with my own children (knock on wood) But I think this is a very needed story. Aw this seems like such a great book!